Have you ever imagined living in a fantasy world? Beautiful castles, islands floating in the air, a ride on an airship or resting with the fairies under a mushroom umbrella? Then this book is for you. 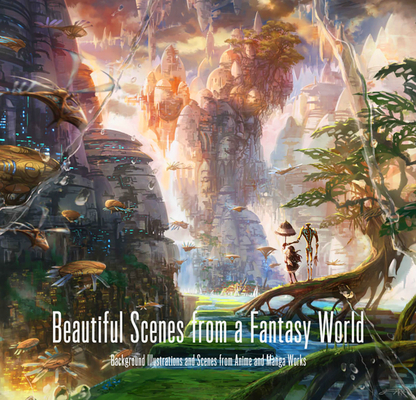 Beautiful Scenes from a Fantasy World is the second title in the Everyday Scenes from Parallel Worlds series. It showcases background artworks featuring fantasy worlds: celestial castles, pirate ships sailing through the clouds, retro-futuristic inventions, deserted architectural spaces, towns that have sunk under the ocean, an enchanted forest, and a space locomotive that runs in a neo-futuristic world. Featuring only a few anthro angels, dragons and other imaginary animals, attention is focused primarily on the beauty of the illustrated backgrounds from popular anime, manga and game creators.